Comfy, cosy and creative! Cherokee Workwear brings women's warm-up scrub jacket that is specially designed to protect you from cold, keep you warm and comfortable all day long. Featuring multiple pockets, the garment offers plenty of safe and secure storage space for your nursing supplies and cell phone. Moreover, it has a jewel neckline and four snaps closure for a modern look while rib knit cuffs and long set-in sleeves, the garment is super functional. Definitely pleased with my purchase at Pulse Uniform. The warm-up jacket was not only priced well but they also fit well. It is easy to care for and super stain resistant. Im glad I found your site. This is a great item, the sleeves are simply perfect, long enough that it does not "restrain" when bending. The cuffs are awesome, its comfortable – not too tight but stay in place when the sleeves are pushed up. Q ) Did it shrink after washing ? A ) It did shrink a little bit but not too much. Less than a size change and it stretched after. Its made of 65 Poly/35 Cotton w/Soil Release which ensures it doesnt shrink to much. Donâ€™t worry and go with your true size! Q ) Is this snap buttons or zipper ? A ) This jacket has snap buttons. 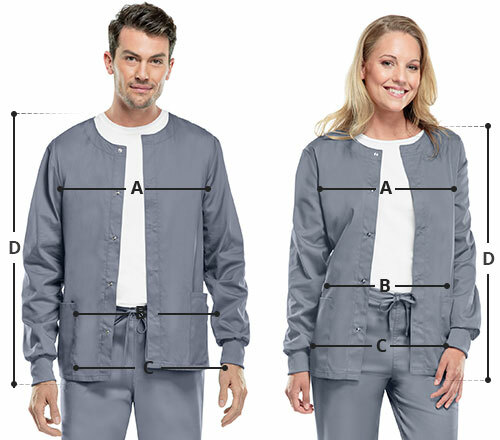 Q ) How do the jacket fit Is it true to size ? A ) Yes it is a true fit and has a perfect fit for size. Q ) Does the jacket have inside pockets ? A ) No inside pockets. It does though have roomy pockets for handy storage. You will find two patch pockets and an additional cell phone pocket.